The New Blockaders combine the use of non-musical instruments, art inspiration, and a critique of musicality that is designed to renew. They released their first album Changez Les Blockeurs in 1982. The 'instrumentation' is made up of objects and bits of rooms being scraped, dragged, thumped, scratched, etc. The soundworld that emerges is something that continues throughout their work, albeit sometimes featuring more processed elements, especially if in collaboration with others. What marks this first album out is its refusal to go beyond what is actually a very limited set of sound possibilities - whilst there is continual clatter, it does not aspire to variety. Unlike other of their releases, there is a dynamic, with changes in emphasis, mainly in the percussive elements - 'Part One,' for example, calms down toward the end, dissipating any momentum it might have acquired and in place of what could have been construed as rhythms are staccato metallic scrapes. Throughout, the percussiveness is jerky, but also insistent, as if trying to create an object that is both resistant, massive, and also something that exists only to be pummelled away. 'Part Two' ends with quiet creaks (having taken in a dog yapping and something like elephantine trumpeting.) Clatters give way to bumps and finally, a hiss like dust. On the face of it, this is very similar to the recordings and performance of Einsturzende Neubauten, who use electrical tools, metals, bits of buildings, and so on at about the same time. But the German group are using destruction, where TNB are destructive of instrumentation. TNB refuse the evocations that characterise 'Industrial music,' and collapse signification into material. Initially, unlike Pierre Schaeffer or Nurse With Wound, the sound seems to maintain its 'dramatic context' - i.e. we know, and are encouraged to notice, what is being played, however unusual it is in the context of music (recording, performance, artwork.) But TNB refuse a virtuosity of the newly musicalised object. If a chair or wall is to be used 'as percussion' it will not be salvaged as a musical instrument, but will retain its flatness, its essential unmusicality. Later recordings and performances even lose the residual possibility of 'properly playing' objects in an indistinction of sound. Refusal is a key part of their strategy. The title of their collection, Gesamtnichtswerk, is important here. It reminds us of Wagner's dream of the 'total art work' - the Gesamtkunstwerk, but the art is replaced by nothing, a nothing that is emphasised in the sleeve notes, as being outside of everything, an emptiness that becomes total rather than being a contained space of nothingness, or some sort of nothing reserve. In place of art then, is nothing - no renewal, no radicality to inspire. As it is a collection, it is not about a total single moment of nothing but the sprawl of nothing where there should be something, which means the 'total' part refers to the entirety of music and art (scraps of which litter the booklets.) Clearly, though, creation has occurred in this nothingness, just as many currently suspect of black holes, but creation based on refusal is not the same as affirmative art, art that believes itself, and this because, not despite, of the 'manifest.' The gesture is backed up by a material working-through of 'nothing' where art/music is supposed to be, and where a space has been cleared, there will be no building, only more clearing. The third CD of Gesamtnichtswerk offers two 'symphonies': Simphonie in X Major and Simphonie in O Minor (1991): neither of which are recognised keys for composition - Simphonie in X Major begins with huge industrial blasts, and moves through phases o machinery destroying itself - there are rhythms, made up of booming and howling. After 7.10 in the 'First Movement,' the noisier part stops and gives way to scraping and thumping, building back up to more overwhelming blasts. The 'Second Movement' is crashier. Simphonie in O Minor is mostly quiet hiss, fizzing, and, gradually rising in volume from virtual inaudibility, a background throbs within it. The symphony is of course the privileged mode of 'classical' music at its height as an elitist art (culturally as well as in terms of class reception and production.) Like the realist novel, its steady narrative and teleology reassures the higher classes of European society. Its structure makes it easy to construct a linear history of aesthetic beauty around it, suggesting a sense of order at all levels. Modernist experiments moved away from the symphony and/or sonata form, and in the case of Noise music, attempted to leave form behind (somewhat optimistically and didactically.) TNB take the symphony into the woods and pound it until it stops speaking its language of reconciliation and resolution. Narrative is specifically undone through the nonlinear trudge through 'nonmusic' in the first 'simphonie' and through absence in the second (without being the smug silence of John Cage's 4'33".) This rejection of narrative is crucial in returning us to the question of influence - which can no longer be heard in terms of inheritance but must be seen as agonistic and retrospective. Not only this, but it is undone - not refused, the spurious belief in individual genius unconnected to history stripped back. This rejection of the notion of the creative genius (as seen in Dada) extends to TNB collaborations, which range from Organum through The Haters to Merzbow, to the 'versions' or 'tributes' on Viva Negativa! The working methods are kept obscure, but it mostly seems as if material is being shared and altered, rather than the Jazz model of the individual player finding a like-minded spirit and realising some sort of meeting of musical minds through presence. Similarly, TNB collaboration is not like remixing, where one self-present individual brings their style to another, in a mutual reinforcement of supposed greatness. Instead, individuality is swamped as the material gets more isolated from any controlling 'artistic' force, and aims for the self-generation and self-maintenance of living organisms. From the descriptions here, it might seem this is a very dry 'music' but it breathes, albeit slightly toxically. Its self-containedness, its removal from individual fingerprints being the key to its uncontrollability for listener and performer alike. This is not to say there is no recognisable style, or that a TNB/Organum recording (such as Pulp (1984) doesn't suggest elements of individual styles combining. But once the 'music' is essentially made of noises, structured noisily and disruptively, without offering a welcoming form, any recombination takes it further from artistically recognisable modes of talent, skill, etc. even if a certain audience would 'appreciate' this music as if it had those attributes. The manifesto too exists as if it were a manifesto, as if it returned us to Dada, but without being merely a knowing reference or something in a 'retro' style. It is there again at the opening of the Viva Negativa!, both written and recorded on seven-inch single. Underneath it lies several hours of material, where TNB material has been ingested by others and 'tributes' made: the manifesto's seriousness (it is not ironic, in the sense of smugly deriding those early twentieth-century manifestos, but it is a humorous take on the idea, I think) is essential for its own failure, and therefore its capacity to set up a tortuous, 'aporetic' path through the material. Its contradiction through eight albums of 'covers,' four of them literally coming after the manifesto, in box 1, is part of the noise not being simply within TNB 'music,' as it establishes an effect that stretches out of the record itself, between records, between TNB and others, between TNB and listeners, and so on. Like Dada, the manifesto cannot but does succeed. It becomes impossible to fail, but to succeed as 'not-even-anti-art' is failure. This 'failure' is what defines noise in its encounter with music, for noise must fail to be noise if it is accepted, and of course it fails if not heard as well. This failure is where noise resides, the fate it selects for itself, or has selected for it. TNB's Gesamtnichtswerk even undoes the idea of a historical compilation, not just through conceptual framing, but also through closing on the twenty-minute silence of 'Null Bei Ohr' ('Nil By Ear.') This is not a reference to, or repetition of Cage (but in being silent, it makes itself the anxiety of such a repetition.) At the end is nothing, in place of Noise music. As it occupies time, the listener awaits, attentive - is it going to burst into sound? Is it made of frequencies beyond hearing? Is it about the machinery of recordings? All of this was never about listening, it almost says. This article by Paul Hegarty (author of Noise/Music) appeared in Organized Sound journal. The first generation of artists producing work in the Noise 'genre,' starting in the late 1970s, did so with a strong focus on performance. The generation that followed, emerged, for the most part, in the early 1990s. The defining characteristic of these younger artists was that they misheard the Noise Music of The New Blockaders. What was intended to be meaningless, or the inconsequential and unintentional byproduct of a conceptual performance, was misheard as being aesthetically pleasing. Beginning in the 1990s, a generation of artists appeared who had grown up listening to the Noise Music of the 1970s and '80s, who were not disturbed by it, were not provoked into antisocial action by it, and did not hear it as the documentation of an art happening which had little to do with the sound being produced, but instead heard it as music. 1990s Noise artists re-musicalized Noise through mishearing it, finding in it beauty, and meaning. TNB are perhaps best known for the ambitiousness regarding the stated goals of their art. The group released a manifesto in 1982 which stated that Noise stood in opposition to all other art that had ever existed prior to it. Their concept divided all artistic expression into two categories: Art and Noise, which they equated with anti-art. Their manifesto reads: 'We are The New Blockaders. Blockade is resistance. It is our duty to blockade and induce others to blockade... Anti-books, anti-art, anti-music, anti-clubs, anti-communications. We will make anti-statements about anything and everything. 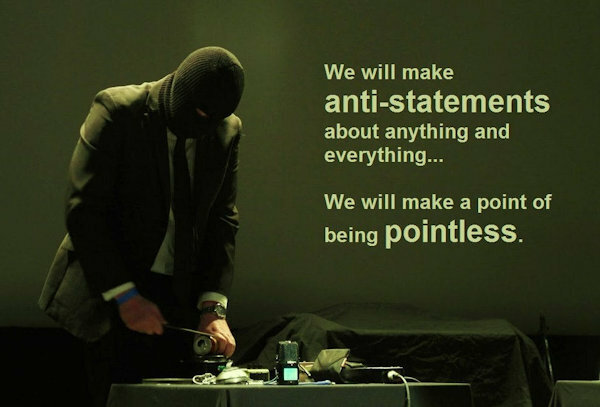 We will make a point of being pointless.' TNB saw Noise as a project that stretched much further than the realm of the sonic, but was an entire movement of art practice, including literary, performance and visual art. In their earliest actions, the audio portion of their performances seems like something of an afterthought, or even perhaps the byproduct of the performative creation of a situation, or environment, which was the groups primary intention. Notice that in the opening lines of the manifesto quoted above, they do not even mention music, even though they are remembered largely as a musical project. I argue that the early works of TNB, though they are considered the originary examples of Noise Music, should be more appropriately considered as a kind of Performance Art. As a result, I wish to suggest that their musical documents from this time can be heard as noisy in that the sounds they capture were not produced as the intentional content of these performances, but were, in large part, the sonic byproduct of the activities that produced them. I believe that if one considers the address of these early TNB works, the audio component was secondary to the creation of a situation and a context in a performance space. As such, they cannot be heard as musical works in the way that most musical works are assessed, but rather as performance pieces, in which sound was produced, but only accidentally and as an element secondary to other artistically expressive concerns. The TNB manifesto also provides us with an understanding of noise (and Noise Music) as a rejection, or an assault on meaning. Like some of the scientific definitions of the word noise, which describe noise as meaningless, random data, TNB argue that their art is likewise, devoid of meaning. This is a common theme which is repeated over and over again in the discourse of Noise Music, but seems to be misleading. Even Cage, who left the actual sounds in his compositions up to chance, understood that meaning was produced in the act of framing those sounds as music, and in organizing them as a performance. In a sense, meaninglessness as an aesthetic imperative is in itself eminently meaningful. If Noise Music was ever noisy in a way that afforded any critically-useful theorization of noise, then it was only ever so for a brief moment. Almost immediately following the first sonic experiments of TNB, The Haters and Hijokaidan, Noise Music's noisiness, it seems, was tamed, subsumed into a predictable, codified art practice and underground music field. This shift can be heard not only in the music itself, but also in the politics of the various artists' stated 'meanings' communicated by their work. Extra-musical elements - including interviews, live performances, album and song titles, and the visual art which adorned the packaging of the cassettes, records and compact discs released throughout Noise Music's thirty-something year old history. Even Anti-Art Is Art... That Is Why We Reject It!